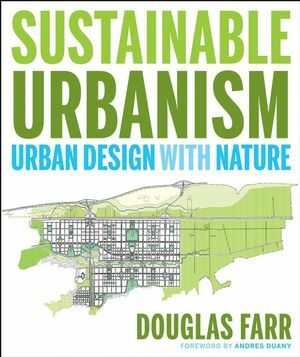 "This book celebrates the magical power of design and of an emerging pattern of human settlement—Sustainable Urbanism—that holds the promise of strengthening the interdependence of all life on earth. . . . This book is a strategic call for leadership in the design and development of the places where Americans live, work, and play." Written by the chair of the U.S. Green Building Council's LEED for Neighborhood Development (LEED-ND) Core Committee, Sustainable Urbanism: Urban Design with Nature is both an urgent call to action and a comprehensive introduction to "Sustainable Urbanism"—the growing sustainable design convergence that integrates walkable and diverse places with high-performance infrastructure and buildings. Enriching the argument are in-depth case studies in Sustainable Urbanism, from BedZED in London, England, and Newington in Sydney, Australia, to New Railroad Square in Santa Rosa, California, and Dongtan, Shanghai, China. An epilogue looks to the future of Sustainable Urbanism over the next 200 years. At once solidly researched and passionately argued, Sustainable Urbanism is the ideal guidebook for urban designers, planners, and architects who are eager to make a positive impact on our—and our descendants'—buildings, cities, and lives. Douglas Farr, an architect and urban designer, is the founding principal and president of Farr Associates. He has served as cochair of the Environmental Task Force of the Congress for the New Urbanism, chair of the AIA Chicago Committee on the Environment, and chair of the U.S. Green Building Council's LEED for Neighborhood Development (LEED-ND) Core Committee. Farr Associates is a Chicago-based firm focused on sustainable design in architecture and urban design. Founded in 1990, Farr Associates was the first architecture firm in the world to have designed at least two buildings to be certified with a LEED Platinum rating: the Chicago Center for Green Technology and the Center for Neighborhood Technology, also in Chicago. The firm designed its own office in the historic Monadnock Building as a LEED for Commercial Interiors pilot project. Part One The Case for Sustainable Urbanism. Chapter 1: The Built Environment: Where We Are Today. The American Lifestyle on the Wrong Course. Pioneering Reforms: Setting the Stage for Sustainable Urbanism. Chapter 2: Sustainable Urbanism: Where We Need to Go. Sustainable Urbanism: The Grand Unification. The Three Steps of Sustainable Urbanism. Part Two Implementing Sustainable Urbanism. Chapter 3: Leadership and Communications. The Power of Paired Choices. Chapter 4: The Process and Tools for Implementing Sustainable Urbanism. RFQ for Sustainable Urbanist Professionals. Benchmarking Municipal Sustainability: The Santa Monica Sustainable City Plan (City of Santa Monica). Shaping Sustainable Neighborhoods with the Toledo Smart Neighborhood Analysis Protocol (SNAP) (Carolee Kokola). A Sustainable Urbanist Neighborhood Plan: Toledo SNAP (Carolee Kokola). Regulating Plan and Form-Based Code (Christina Anderson). Incorporating Sustainability through Codes, Covenants, and Restrictions (CC&Rs) (Dan Slone). RFP for a Sustainable Urbanist Developer (City of Victoria, British Columbia). Part Three Emerging Thresholds of Sustainable Urbanism. Chapter 5: Increasing Sustainability Through Density. The Transect of the Everyday. Water and the Density Debate (Lynn Richards). The Sustainable Corridor (Doug Farr, Leslie Oberholtzer, and Christian Schaller). The Integration of Transportation, Land Use, and Technology (Shelley Poticha). Biodiversity Corridors (Rebecca L. Kihslinger, Jessica Wilkinson, and James McElfish). Neighborhood Definition (Victor Dover and Jason King). Neighborhood Completeness (Eliot Allen and Doug Farr). Neighborhood Housing (Laurie Volk and Todd Zimmerman). Neighborhood Retail (Robert J. Gibbs). Economic Benefits of Locally Owned Stores (Matt Cunningham). Healthy Neighborhoods (Melanie Simmons, Kathy Baughman McLeod,and Jason Hight). Walkable Streets and Networks (Dan Burden). Universal Basic Home Access (Eleanor Smith). Managing Travel Demand (Jeffery Tumlin). Public Darkness (Nancy Clanton and Todd Givler). Stormwater Systems (Jim Patchett and Tom Price). Food Production (Lynn Peemoeller and Jim Slama, with Cathy Morgan). Outdoor Wastewater Treatment (Thomas E. Ennis). Indoor Wastewater Treatment (John Todd Ecological Design). Chapter 9: High-Performance Buildings and Infrastructure. The Impact of Planning on Building Energy Usage (Alan Chalifoux). Large District Energy Systems (Doug Newman and Robert Thornton, John Kelly, and Adam Lund). The 2030 Community Challenge: Economic Growth with Sustainable Urbanism. Part Four Case Studies in Sustainable Urbanism. 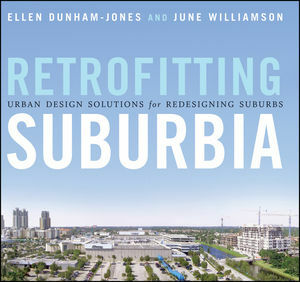 Chapter 10: Lessons Learned from Sustainable Urbanism. Glenwood Park: Atlanta, Georgia, United States. Holiday Neighborhood: Boulder, Colorado, United States. High Point: Seattle, Washington, United States. Loreto Bay: Baja California Sur, Mexico. Civano: Tucson, Arizona, United States. Chapter 11: State of the Art in Unbuilt Sustainable Urbanism. Lloyd Crossing: Portland, Oregon, United States. New Railroad Square: Santa Rosa, California, United States. Uptown Normal: Normal, Illinois, United States. Galisteo Basin Preserve: Santa Fe, New Mexico, United States. Pulelehua: Maui, Hawaii, United States. Coyote Valley: San Jose, California, United States. case studies of exemplars of sustainable urban design. Sustainable Urbanism provides clear direction for urban designers, urban planners, and architects to design cities and developments that are sustainable and reduce environmental harms. 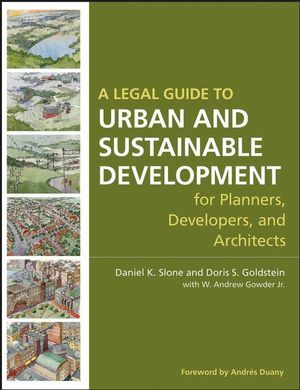 The text includes background on sustainability, standards for sustainable urbanism, and case studies of exemplars of sustainable urban design. Written by noted national experts on sustainable urban design, who are involved with both the Congress for the New Urbanism and the US Green Building Council.